Creating a full Windows backup by imaging using the built it Windows Imaging Tool, Acronis TrueImage, EaseUS Todo Backup and Macrium Reflect etc is pretty common for more advanced computer users, but it’s recommended for all users to keep backups in case of crashes or hardware failures. When your system is corrupted and unable to boot, all you need to do is just boot up the computer with the imaging software’s rescue media, locate the image and it will restore your system back to the time when you created the image. Imaging is different from just backing up your files or selected folders because a complete image is created for the whole hard drive or partition and its structure, not just the files or folders. The problem with some imaging software is it doesn’t allow the creating of images for external devices such a USB flash drive, digital camera or MP3 player, or perhaps you prefer not to install a full software package just to back up a small flash drive. Although the space on USB Flash drives and memory cards is not as big as computer hard drives, it’s still nice to create a full backup and then save the drive contents as a single image file. For someone with only 1 flash drive, it’s useful to have full image backups so you can swap between them when required. Here are 4 free tools which you can use to create images of USB memory sticks, memory cards and MP3 players, then restore them when you need to. ImageUSB is by PassMark software who make well known shareware tools such as Performance Test and BurnInTest. This little tool is free and portable with a few very handy features such as being able to read and create images from more than one USB flash drive at once, and also write an image back onto more than a single flash drive in one go. Everything is well laid out into a series of steps and you simply select the USB drive(s) to work on, and then choose whether to write to the selected drive or create an image from it (ImageUSB refers to a USB flash drive as a UFD). Then browse for the backed up file or type in a new name and press the button in step 4 to start the process. You can verify a newly created image or the contents of a written USB drive by ticking the “Post Image Verification” box although this will increase completion time. Backup images are created as non compressed .BIN files. ImageUSB can write both the .BIN files and also ISO images onto USB although writing an ISO file can be troublesome and you might not be able to read the drive contents properly because of the CDFS/UDF file systems used by ISO images. A log file will be created in the same folder for each BIN image which includes MD5/SHA1 check sums for the file and any verification results. Works on windows XP and above. This is a very simple and easy to use tool, but has something you need to be aware of which is it will list all physical drives and volumes not just the USB storage devices. You need to select the correct drive carefully and DiskImage will also start on the Write Image tab so to read a USB device you need to click on the Store Image tab. Usage is easy and you simply choose the drive, browse where to put the new file and give it a name, then click the Start button. The whole device will be backed up uncompressed to the IMG file format and the file can then be viewed or files extracted by tools such as 7-Zip or UltraISO etc. Writing the image back out is simply a case of selecting the drive to write to and locating the IMG file. DiskImage is a tiny portable executable of only around 70KB (a setup installer is available) and works on anything from Windows 98 to Windows 8. 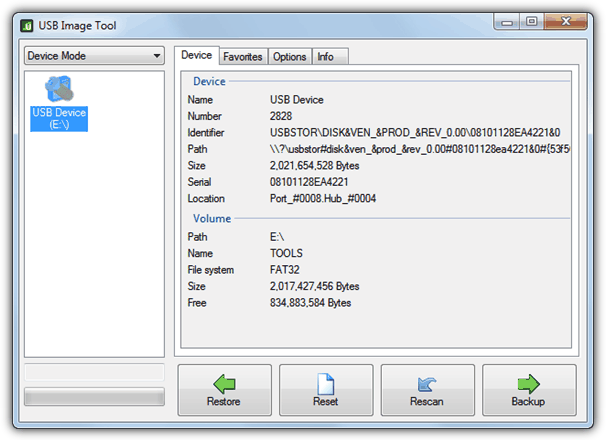 USB Image Tool is a portable program that can create full images of USB memory sticks, MP3 players and any other storage devices that are mounted as USB drives. The program has a drop down option to let you select between taking an image of the whole USB drive or just the first volume on the device, useful if you have more than a single partition on your USB drive although the boot sector will not get saved in Volume mode. All you have to do is select the USB drive, click backup and choose the file name and save folder. 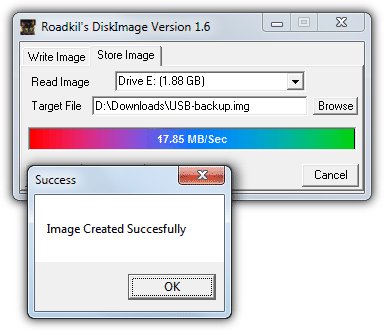 USB Image Tool backs up drives to a non-compressed IMG file by default. To compress an image file, click the “Save as type” drop down when asked where to save the file, and extra options of saving as Zip compressed (.IMZ) or GZip compressed (.IMG.GZ) files are available. Obviously this might take a bit longer but could reduce the size of a large image file by a few Gigabyes depending on the data on the drive. There’s also a Favorites tab where you can keep IMG file locations stored for quick access and some options are available such as creating an MD5 check sum with the backup file, showing non-removable devices and defining a naming structure for the backup files. The .NET Framework 3.5 is required so XP and Vista will need it installed. For more advanced usage like creating one click shortcuts and scripts, a command line usbitcmd.exe is included. Works on Windows XP and above. If you want a more advanced tool with several other functions besides being able to backup your USB device, then RMPrepUSB could be a useful tool. In addition to creating a full image backup of a drive, it can also install bootloaders and various operating systems onto USB, test a device’s write speeds, wipe a drive and run checks to see if a USB flash drive is the correct capacity and not fake. The only options you need are the Image Tools in the middle of the main interface to make and restore USB image files. “Drive -> File” will make the backup file and there are some advanced options available after selecting the new file’s name. These are choosing the start sector, partition or size amount to skip, and the amount of data, partition or MBR to copy. You can just press enter each time to choose the defaults of everything on the USB drive being copied if they’re acceptable. Writing an image file back to a drive accepts a number of file formats although not all of them will be compatible with writing to USB flash drive or memory card etc. They include standard .BIN, .IMG and .IMZ files, and also Zip and 7-Zip archives. Interestingly, it also supports virtual hard disk files such as .VDI and .VHD used by software like VirtalBox and Virtual PC although success writing to USB will be limited. RMPrepUSB has installer and portable versions and works on Windows XP and above. Note: These imaging tools will create a backup file that is usually the exact size of your USB device because a sector by sector copy is made of the whole drive which includes empty or unused sectors, not just the visible files and folders. Therefore, backing up a 16GB flash drive will read the whole device and create around a 14GB uncompressed image file, even if the drive has very little data on it. Read the article again, it says you can create a bin file from usb or write a bin/iso onto USB. Where does it say you can create iso files? These tools are indeed very interesting. My specific need is to copy the folders and files on a USB flash memory stick, where one folder is specifically for “shortcuts”, i.e. hyperlinks to various folders, which works as a kind of table of contents. Everything else that I need to back up works using copy and paste, but not the hyperlinks, which link to the old drive and not the new drive. Is there a solution to this, other than imaging? I mean is there a solution that does not tie up so much empty disk space? If not, then I will work with the limitations of imaging. I did not like any of these flash drive imaging utilities as they only save the complete flash drive image which I do not like as they all create a very large full drive image regardless how small data you have on your flash drive. Let me explain, if I have a large 256 GB flash drive and I only have a 10 GB data on this drive, all of the above mentioned programs will save the full and complete 256 GB image instead of just the 10 GB data, a complete waste of unnecessary space as they create a very large backup image file. Unfortunately the popular Macrium Reflect imaging program does not recognize flash drives so this program will not work. Luckily, the latest Acronis True Image 2018 build 12510 will successfully backup only the 10 GB data image and this backup image file will be much smaller than taking the full (unnecessary) 256 GB flash drive like all the above listed programs do. Acronis TI is not free but it is the only one I found to do exactly what I want and need. If you do know of another program that will do exactly what Acronis TI can do and is FREE then please share it here with us all. Flash drives have gotten so large and cheap that it is common to have a little 500 MB bootable image on a 32 GB flash drive. Since these tools make uncompressed image files, imaging such a flash drive can waste a LOT of space. So the obvious solution is to compress the image files. What tool(s) would you recommend for that? Which tools happily work with such enormous files, and which are fast enough to not be overly painful to use? One other thought: to make an image file which is maximally compressible, you should first zero-out the free-space on your flash drive, before making the image file. The easiest way to do that is with Mark Russinovich’s SDelete tool. Hi All, Thanks RAY for another wonderful article, System Image of USB drives was beyond my thinking ! I tried the robust option : USB Image Tool ( RMPrepUSB for future ) but it takes considerable time to image even a 8gb pendrive on a quite speedy system ! I would like to ask what will be the Best + Fast + Versatile way to image a single vs multiple partitioned USB drive ? In the meantime i would like to explore the installed Macrium Reflect Free for the purpose ! Thanks & Regards. As always, we are accustomed to your good articles. Thank you. Thank u very much. But as u said the image files are as big as the flash drives no matter how much data they contain. Is there any app that will create image files sizing according to the size of the contents in the flash drive? Which one (if any) can copy a GPT partitionned USB key ? I would think options 3 or 4 can do that as they copy the whole drive starting from sector 0.